The Wiz Live!, which aired on NBC in December 2015 and was one of the highest rated live shows in the network?s history, is headed to the Broadway stage in New York City, but the August Wilson Center (AWC), with the help of Pittsburgh Cultural Trust (PCT) and FashionAFRICANA, had the good fortune of being the one and only outlet to showcase its magnificent costumes, designed by Tony award-winning costume designer (HAMILTON) Paul Tazewell, from September 23 through November 30. Demeatria Boccella, founder of FashionAFRICANA, has very close ties to people like Kenny Leon who directed the Wiz Live. She had the opportunity to bring the costumes to Pittsburgh and I had the ability to create a gallery setting for the exhibit. “We all collaborated to present this work in the galleries of August Wilson Center. The galleries are very large, grand spaces so it was the perfect setting. The presentation was stunning, the costumes are gorgeous and the installation of the costumes was on the scale of the Metropolitan Museum of Art!” Janis Burley Wilson, vice president of strategic partnerships at the Pittsburgh Cultural Trust, shared with TNJ.com in a recent interview. Hosted by PCT, the exhibit titled ‘Costumes of The Wiz Live! The Work of Paul Tazewell’ brought together approximately 7,000 attendees including hundreds of school children who were treated to a special curriculum underwritten by Pittsburgh Steelers’ head coach Mike Tomlin and his wife, global fashion designer, Kiya Tomlin. There was even a large-scale exhibit opening called the Emerald Ball, presented by FashionAFRICANA where, yes, people wore their best emeralds. According to Burley Wilson, that too was very well attended. “In addition to the opening event, we’ve also had a number of events throughout the season like our PCT Gallery Crawl which attracts thousands of people in and out of the numerous galleries we have throughout the cultural district; there were school tours and the educational program sponsored by Mike and Kiya Tomlin. Through that program, student groups were able to visit the center to see the exhibit and learn more about the costumes, meet the costume designer Paul Tazewell and learn more about costume design, art and theater. It was a very exciting opportunity for the AWC and the Trust,” she says. She went on the say that while the curriculum for the students dealt mostly with costume design, it also touched on African American culture, art and building self esteem. “It highlighted the fact that the cast of The Wiz Live! was mostly African American, as were the director and the costume designer. In that regard, it was a very monumental and historical piece to have aired on NBC. And I?m sure that they touched on the original production of The Wiz from 1975,” notes Burley Wilson. And apparently, audiences got it. And not just Black audiences either. 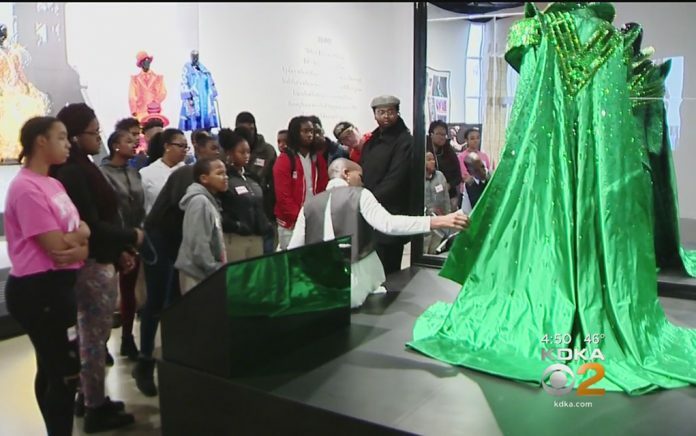 Burley Wilson said the exhibit brought out a diverse audience who traveled from the suburbs and other places just to see costumes from The Wiz. “The exhibit attracted a broad audience into the AWC that might otherwise not have visited for some of the the AWC?s other programs. AWC is an African American cultural center, but The Wiz Live! really had a broad audience. People came specifically to see the work. It was great for the city, in general,” she says. Built in 2009, the construction and design of the AWC was led by architect Allison Williams; it is owned by the African American Cultural Center. PCT was hired to manage the building and Burley Wilson has been curating programming there since 2015. Boccella served as the exhibit curator.